Fun and energetic, this is an educational and challenging musical which attempts to inform a modern audience about the constantly changing social landscape of today. In today’s culture, the conversation surrounding gender equality has become as important and as discussed as any other social issue. The term “homosexuality” which in the past may have been uttered with hesitation—especially in news outlets—is now commonplace among households, discussed in many different mediums, and in 2015 is a subject which is more relevant than ever. 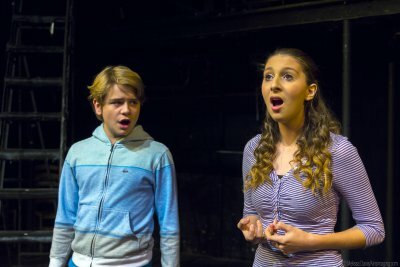 In Out of My Comfort Zone, Ivy Vale (book, lyrics & music) and Rick Reil (music) tackle the issues of today with a new musical which takes a look at how the lives of modern children and teenagers have changed as society takes further strides towards identity and gender equality. Surrounding the daily life of a town’s worth of middle and high school students, the usual suspects are easily recognizable: the jocks, nerds, musicians, and misfits; the popular crowd, perfect couple, and the outcasts who eat lunch alone. At first glance, the only thing that really appears to be any different than this writer’s own high school experience would be the smartphone with which each member of the cast is outfitted. 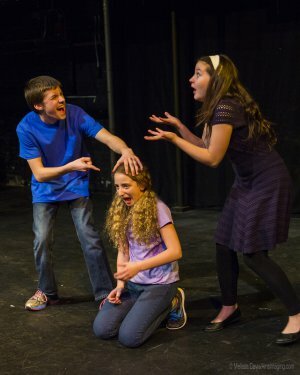 Led by Josh (Will Ehren) and Rachel (double cast with Savannah Leroy and Violet Vale splitting performances), childhood friends since the second grade, Josh and Rachel think they may have feelings for each other but are terribly afraid of this truth. The two characters have many missed opportunities to talk about their feelings as they lament to their friends about their predicament. These two characters are the binding thread of the script, but every single “clique” or teenager has some adolescent conflict with which he or she is dealing. As with all productions by the Children’s Acting Company & Academy, the cast is comprised entirely of children and teenagers—in this case between the ages of 12 and 16—and for all its innocence and simplicity, the charm in this production is its sheer authenticity. 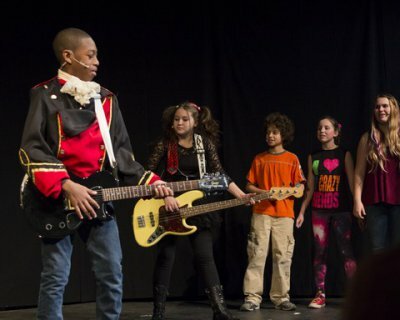 Children and teenagers are by nature unfiltered, and to have kids playing their own age on stage is the recipe for an afternoon of uninhibited fun. For the most part, this is an impressive outing for a group of young and aspiring artists, and many of the cast members have already worked professionally in TV, film, or on-stage. Conceived as a new rock musical, Out of My Comfort Zone is full of catchy songs which, though intended for a younger audience, carry substance. In Act 1, most of the songs are plain energetic fun—namely “The Geek Rap” or “Heavy Metal First Kiss”—while the content in Act 2 is of a markedly more serious tone. The character of the Viper (Michael Flynn) is the tipping point in the theme of the show. The archetypal bully, he’s the one who makes fun of and hurts people for seemingly no reason. “Not That Kind of Guy,” a song early on in Act 2, is a far departure from the rest in its subject material. As the varying storylines reach a climax, the themes and the message follow suit. For the most part, the payoff is satisfying, however, at times the script did feel a bit crowded: in theory, good writing technique would suggest a conclusion to the story of every character, however in times like these—and in a cast of fifteen—the age-old writing adage “kill your darlings” is of mind. Co-directed by Mimi Stuart and lyricist Ivy Vale, Out of My Comfort Zone is a statement on the importance of keeping education relevant. Thought provoking in an approachable way, this is a musical which broaches a topic which otherwise might not be very easy to discuss with a child. Likely without realizing it, the cast of this piece seeks a noble task: by participating in a production with such bold convictions, these young actors are helping to change society in a tangible way. With an emphatic message, fun soundtrack, and an enthusiastic cast, this is a piece of theater which caters to a very specific target audience but hopes to further a worldwide social cause. A well-performed but rambling biographical fantasia about the famed French entertainer focusing on accusations of his German collaboration in W.W. II. Story of two lovers dealing with an unexpected pregnancy is lost in the face of an uneven and poorly directed production. A faithful solo theatrical adaptation of Gogol’s classic short story about a low-level civil servant’s mental decline in the oppressive Russia in 1835. What this psychological thriller lacks in coherence, it makes up for in suspense.